Vizag Steel Junior Trainee Hall Ticket 2018: Vizag Steel Plant Junior Trainee (JT) written test is scheduled from 25th October to 28th October. 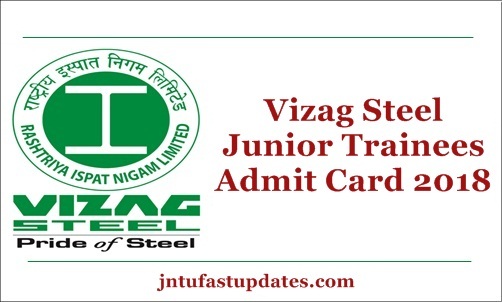 Candidates who are going to attend the VSP Junior Trainee examination can now download the hall ticket from the official portal, vizagsteel.com. The hall ticket/admit card is presently accessible to download for Junior Trainee written test. Candidates can download the admit card and take a printout of it to carry to the examination. From the hall ticket, candidates can check the information of their examination venue, date, and timings information. The Vizag Steel JT Hall Ticket is the must to carry document. Aspirants have to carry the carry the hall ticket without fail to the examination. The examination officers will let the applicants proceed with the test only after cross-checking their hall tickets. If anyone misses taking the hall ticket, they will not be allowed to the examination. Keeping this in mind the aspirants can get ready with the hall tickets while going to the examination. More details of Vizag Steel hall ticket are given below. Rashtriya Ispat Nigam Limited – Visakhapatnam Steel Plant (RINL-VSP), a Navratna Company under the Ministry of Steel, Government of India was established in the year 1971. This organization recruits the eligible personnel by conducting the tests. Recently the VSP recruitment notification for 664 Junior Trainee posts was released. The Notification announces Mechanical, Electrical & Metallurgy. Candidates eagerly waiting for VSP jobs have utilized the opportunity and applied for the posts. The selection of suitable aspirants will be done through the computer-based test (CBT), document verification, and medical examination rounds. Aspirants need to qualify all the rounds with good merit to shortlist for the Junior Trainee posts in VSP. Candidates will be shortlisted purely on the basis of merit. Hence the competitors with good merit will be taken into consideration at the time of final selection. As the examination is scheduled from 25th October to 28th October all the applicants are hereby informed to download the admit cards from the VSP official website, vizagsteel.com. The hall ticket download link is activated on the VSP/RINL portal. After downloading the hall ticket, take a hard copy of it and keep it safe to carry to the examination. Also, check the information of candidate’s name, register/hall ticket number, date of birth and other details. If any corrections occur in name, DOB, or other column, candidates can complain to the authority for the correction. The wrongly printed details will be corrected and new admit cards will be issued for the aspirants within a short span of time. Candidates must carry the valid identity proof copy and the hall ticket to the examination. Otherwise, they may lose the chance to attend the test. For reference of aspirants here we have given the VSP JT Exam pattern 2018 and also hall ticket downloading process. Go through the information for keen understanding. 75 Questions pertaining to the respective technical subject. Written exam paper will be set Bilingual English & Telugu. Step 1: Initially, go to Vizag Steel Plant Official Page, vizagsteel.com OR Click the direct link given below. Step 2: Search for VSP JT Admit Card / Hall Ticket 2018 link, and click on it. Step 3: Fill the details of DOB, Registration Number Etc. Click on Submit Button. Step 4: Admit Card will appear on the screen. Press Ctrl + P to take the printout of it.